Giuseppe Tartini was generally considered the greatest violinist in Italy after the death of Vivaldi. It makes sense to mention the latter's name as Tartini's rather negative view on Vivaldi's violin concertos is well known. He was a representative of the new aesthetics which developed in the mid-18th century and which aimed at a greater naturalness in music. In this respect one could consider him the counterpart of Christoph Willibald von Gluck who followed the same ideal in opera. Tartini's oeuvre comprises almost exclusively music for his own instrument. He composed about two hundred sonatas for violin and basso continuo and 127 concertos. The latter are the subject of a recording project by the ensemble L'Arte dell'Arco and the label Dynamic. This comes to a close with this 17th instalment. I have heard a number of them and it is quite surprising how versatile Tartini turns out to be. This last volume includes eleven concertos but there is really no similarity between them. Every time Tartini comes up with new melodic subjects and fresh ideas. The texture is largely the same: the concertos are all scored for solo violin, strings and basso continuo. They consist of three movements: fast - slow - fast. The slow movement is the shortest, and here the violin opens the proceedings: there is no tutti introduction as in the fast movements. It is here that Tartini achieves the highest degree of expression: the stage is for the violin which then excels in expressing all kinds of emotion and idea. These are often inspired by literature: some of the slow movements have a motto. For today's scholars and interpreters these are almost impossible to interpret.However, these movements are not intended to be illustrations of mottos which only inspired Tartini to write in a certain way. From that angle it doesn't really matter what they are about or where they come from. Tartini was critical of Vivaldi's concertos because of their extreme virtuosity. That does not imply that his own compositions are easy stuff - far from it. Having heard Francesco Maria Veracini play, he was so embarrassed that he withdrew from any public performance and worked very hard to improve his technique. He was mainly critical of Vivaldi's pyrotechnics, apparently for their own sake, whereas his virtuosity aimed at the expression of emotions and ideas. The concertos are not devoid of virtuosity. He makes regularly use of double-stopping, there are shifts of rhythm within single movements and some movements include rather unexpected melodic turns. Stylistically Tartini is a representative of the era between baroque and classicism. According to the German composer and theorist Johann Mattheson melody was the foundation of music rather than counterpoint as was the case in the preceding era. Tartini's music reflects this view as there is little counterpoint in these concertos. 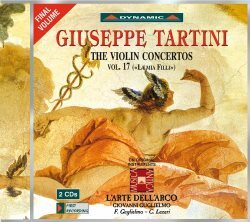 Tartini is a master of melodic invention, and that is one of the reasons why it is not hard to listen to these two discs at a stretch. This is also due to the performances. This is the first time that Tartini's violin concertos have been recorded complete and one should be thankful to the members of L'Arte dell'Arco for their involvement. Over the years they have grown and improved the standard of playing which was not always impressive in the early stages. The latest volumes are much better and that also goes for this last pair of discs. Although there are still some precarious moments, especially in the realm of intonation, the interpretations are generally very enjoyable and bring out the finer qualities of Tartini's concertos. In 2020 it will be 250 years since Tartini died. This project has finished well on time. One can only hope that the example of L'Arte dell'Arco will inspire other violinists and ensembles to turn to Tartini's concertos. It would be nice if in the commemoration year we have more recordings to choose from. A little less Vivaldi and a little more Tartini; is that too much to ask?